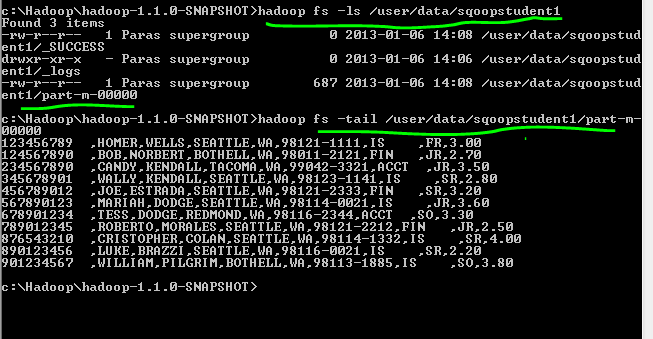 This is a Quick Post, Just want to share a command to upload local data to HDFS using Hadoop Command Line. HDFS and MapReduce inner workings in a nutshell. 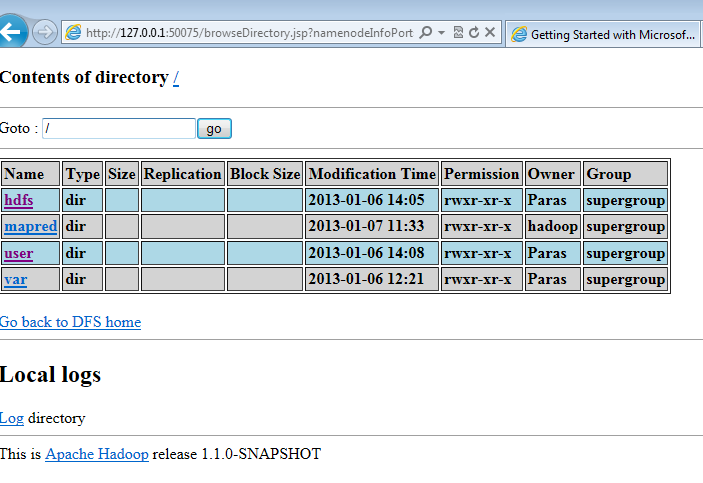 Hadoop on Windows: How to Browse the Hadoop Filesystem? This Blog post applies to Microsoft® HDInsight Preview for a windows machine. 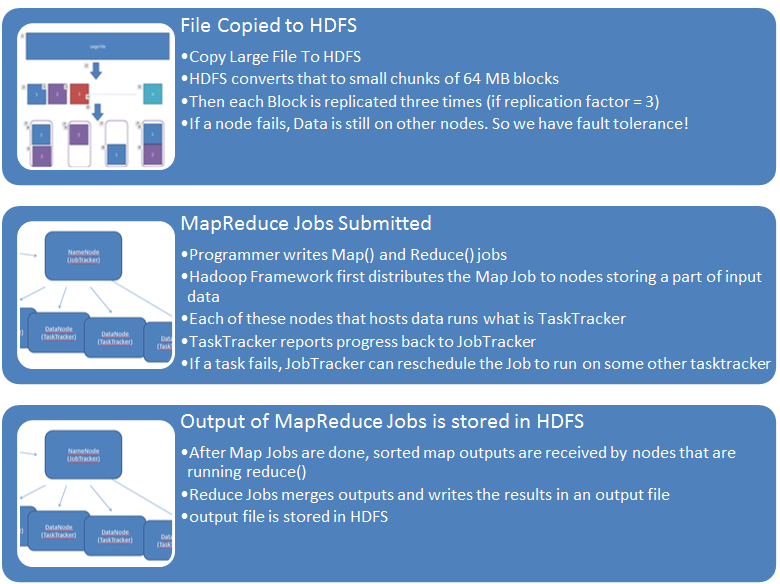 In this Blog Post, we’ll see how you can browse the HDFS (Hadoop Filesystem)? 1. 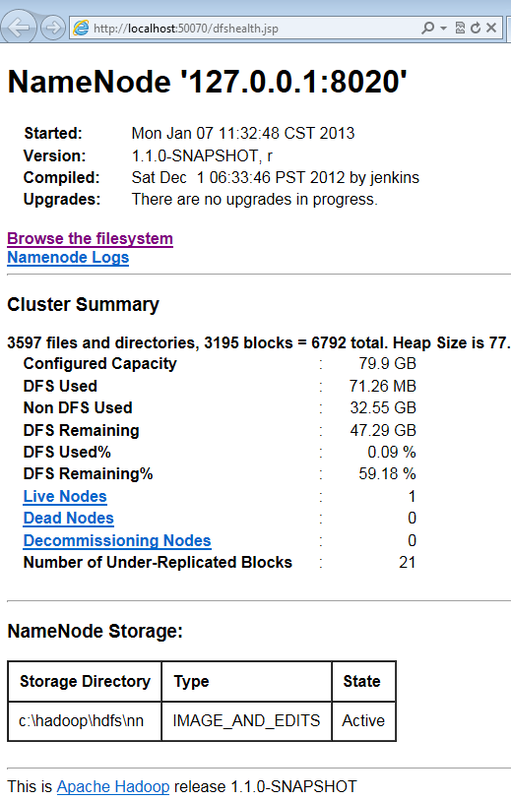 I am assuming Hadoop Services are working without issues on your machine. 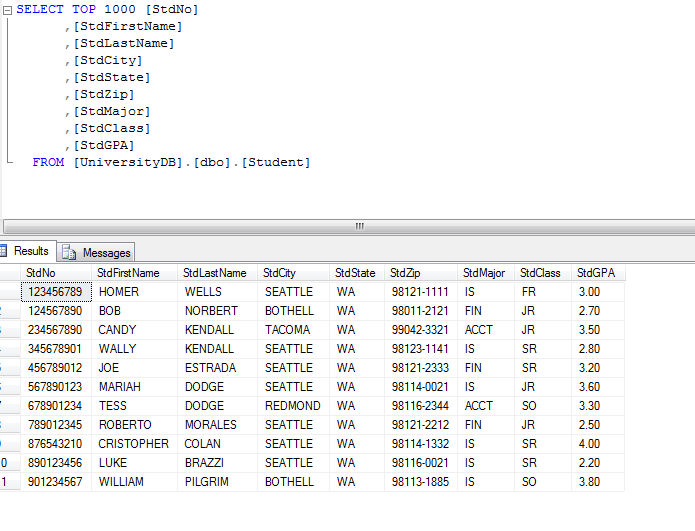 In this post, we’ll see how to use Sqoop to load data into HDFS from SQL Server? 3a: Username and Password that Sqoop would use to login to the SQL Server database. If you create a new username and pasword, test it via SSMS before you proceed. *This path may change in future, but navigate to the bin folder under the SQOOP_HOME. 6. 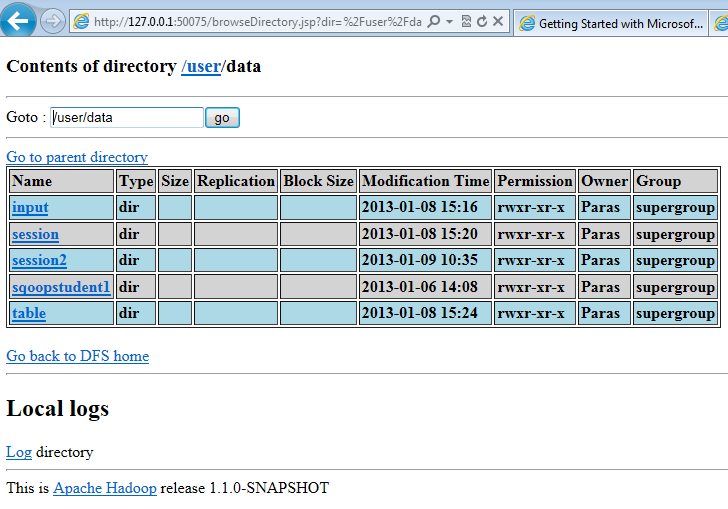 Run dir command to see various files under this directory. Also you can run sqoop help for more information on the command that we are about to run. 8. After successfully running the above command, let’s browse the file in HDFS! That’s about it for this post! 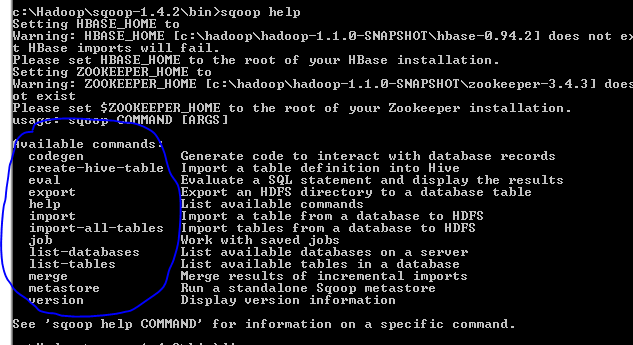 Before we begin, I assume you have access to Hadoop on azure, Have your sample data (don’t have one? learn from a blog post), familiar with Hadoop ecosystem and know your way around the Hadoop on Azure Dashboard. 1. Have your data to be uploaded ready! I am just going to Copy Paste the File from my host machine to the RDP’ed machine. In this case, the machine that I am going is the Hadoop on Azure cluster. 4. Copy-Paste the File. It’s a small data file so this approach works for now. 1. 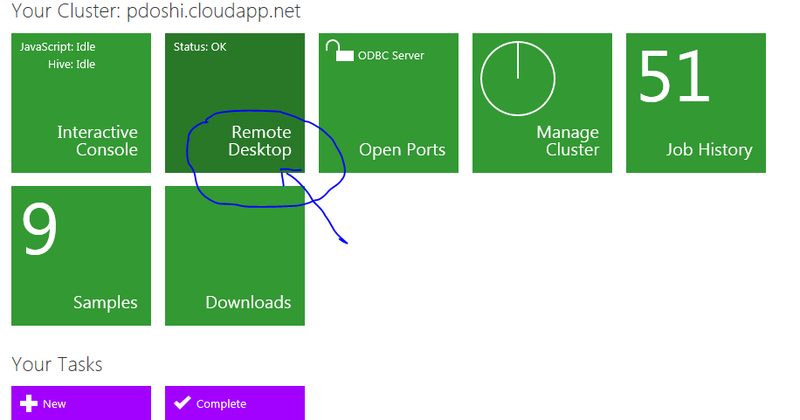 Stay on the machine that you Remote Desktop (RDP’ed) into. Note that for the purpose of this blog-post, I’ve chose string as data type for all fields. This is something that depends on the data that you have. If I were building a solution, I would spend some more time choosing the right data type. 2. Go to the Hive Console and run the show tables to verify that there is a tweetsampletable. 3. Now if you haven’t, Download and Install the Hive ODBC Driver from the Downloads section of your Hadoop on Azure Dashboard. 5. After that, Open Excel. I have Excel 2010 64 bits. 7. Choose the Hive connection > select Table > Select Columns > And off you go! you have Hive Data in Excel! 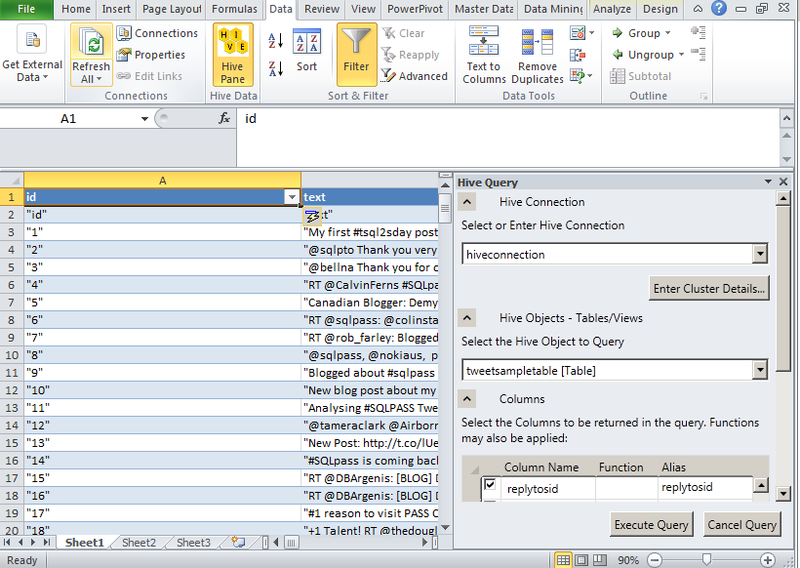 In this blog-post, we saw How to Load Twitter data into Hadoop on Azure cluster and then analyze it via Hive add-in for excel?